Spoiler Alert: Numbers That May Surprise You! 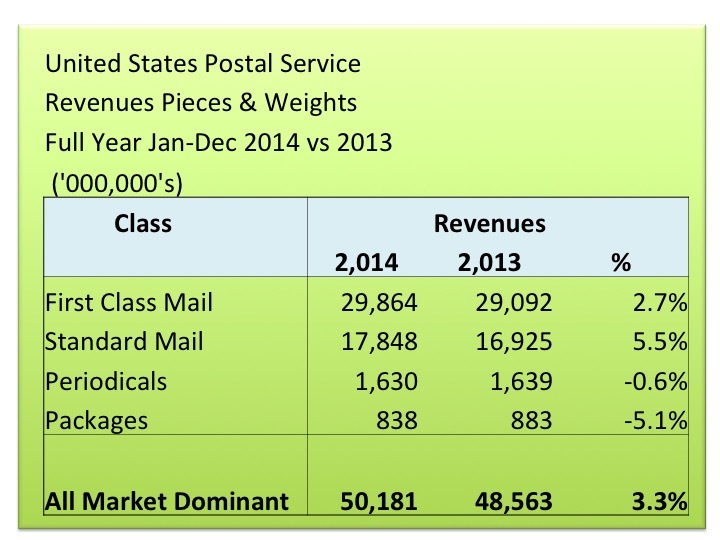 The latest USPS report on mail volumes is out, and magically, incredibly, it points up. The number-laiden Revenue Pieces and Weights report January 1- March 31, 2016 tells us volume for the past quarter was up 1.4%. For many of you, the news is lame. After all, what is an additional 520,183,000 pieces of mail? Actually, it turns out to be 37,414 tons, the equivalent weight of 454 Space Shuttles. Which again points to the enormity of the US Postal Service. Critics tend to discount the post office for its supposed obsolescence, but if you hang around a mail sorting facility for a moment, you know this is BIG, massive business. So I for one am excited that mail volumes grew this past winter. The better question may be why are they up? It turns out that Direct Mail increased 1.9% over the same quarter a year ago, 355,488,000 pieces. That could be related to political fundraising mail, and a cautious optimism in the economy. 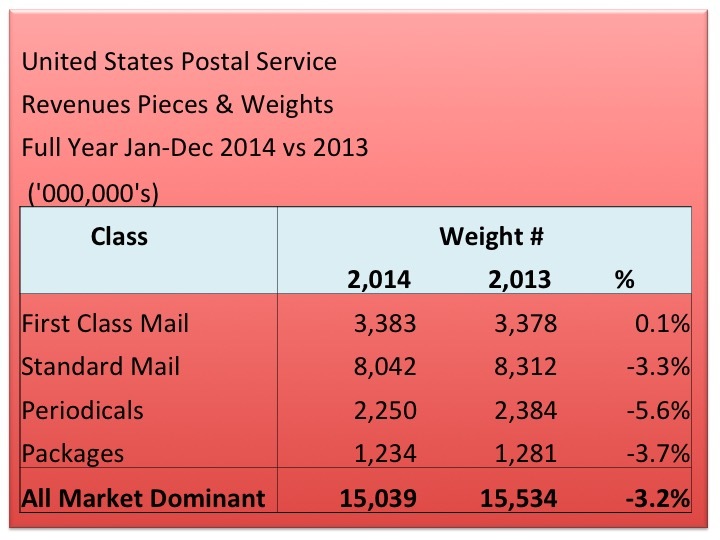 First Class mail increased by 0.8%, 135,253,000 pieces. An astounding turnaround! Mind you, that includes all business mail. When it comes to individually stamped mail, like birthday cards, bill paying and charitable donations, it was down 2%. There is more intriguing news on this personal category in a moment though. The big winner is Parcels and Packages which are exploding, correction, booming, sorry, mushrooming 13.2%. 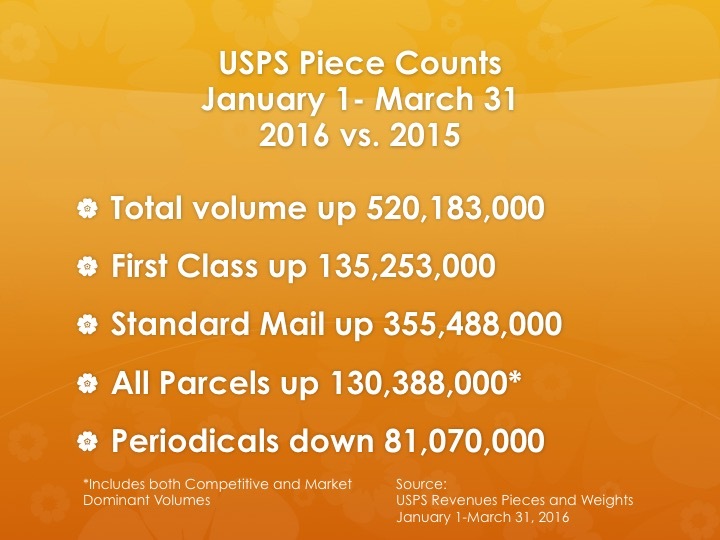 This past quarter the USPS delivered 1,121,723,000 parcels, total weight: over 1 million tons. What the report also reveals is the continued slide of Periodical volume: magazine counts dropped by 5.6%– 81,070,000 pieces over the three months compared to 2015. Magazine subscriptions continue their slide. The eye opener in this display of numbers is how mail looked just five years ago. 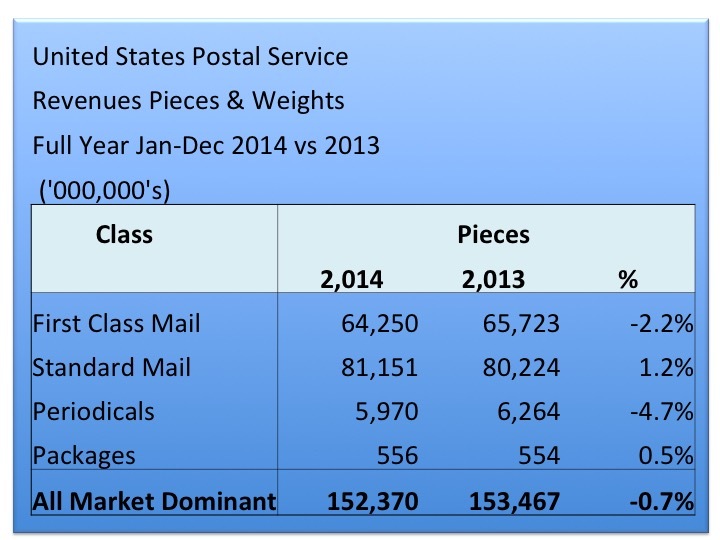 In 2011, total mail count for the quarter was over 41 billion pieces. Since then volumes have dropped 6.7%, about 3 billion pieces. While this is a generally understandable result of internet and social media, it is worthy of note that direct mail dropped only 3.4%, thus illustrating its successful economics. 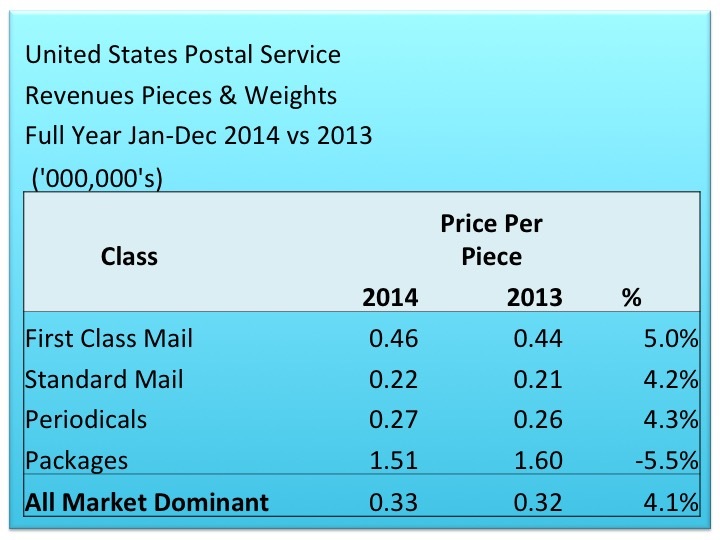 By comparison, First Class Mail dropped nearly 13% in the same period. Magazines, down 22%. You have to hand it to USPS management for the growth in Parcels. While the internet may have crushed letter mail volumes, it opened the door for USPS package delivery. In 2011, Q2 Parcels totaled 667 million pieces. This past quarter, USPS delivered 1.1 billion parcels, up a whopping 68% over five years. And revenues? $3.7 Billion, up 82% from 2011. The more we buy online, the more the post office delivers. 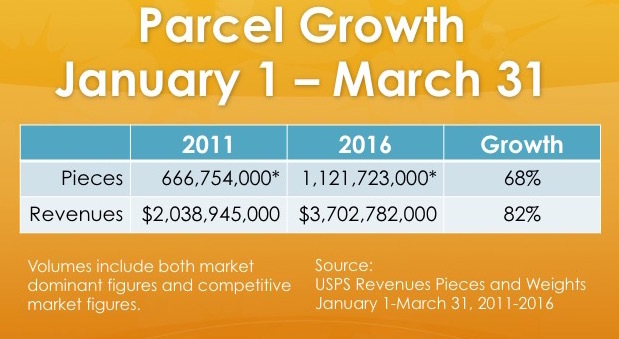 The significance of Parcels growth is that these numbers represent the USPS position in a competitive market with peers like UPS and Fedex. The encouraging story about Stamped Letters is worth a peek. Personal letter volume cratered in 2008 and 2009 by -17.2%, and in 2010 by another -16.3%. 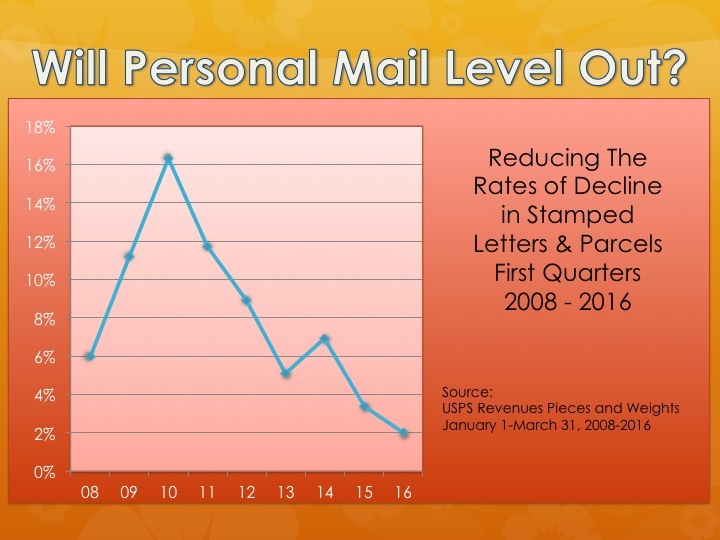 Since then, like a plane pulling out of a disastrous dive, Stamped Letters have nearly leveled out this past quarter at only a -2% decline. 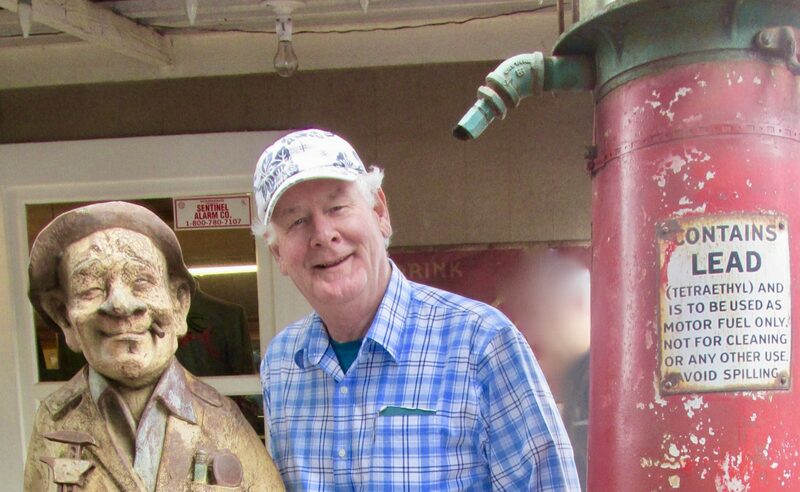 This leads one to believe that the attrition of postal mail to email and social media has just about finished. Next month marks the end of another quarter for USPS record keeping. 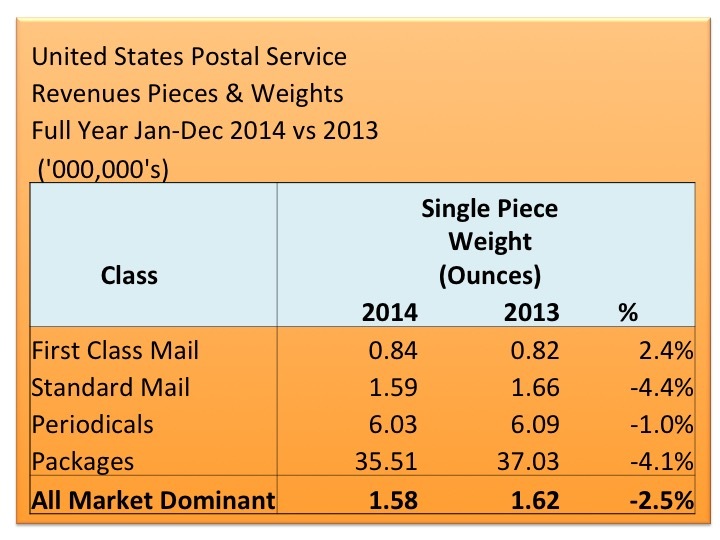 It will be interesting to see how the impact of the recent 1-2 penny decrease in price might improve mail volumes. The direct marketers will take note, and who knows, maybe someone will pick up their pen and write one or two more letters as well. Here’s the report for you review. Enjoy!